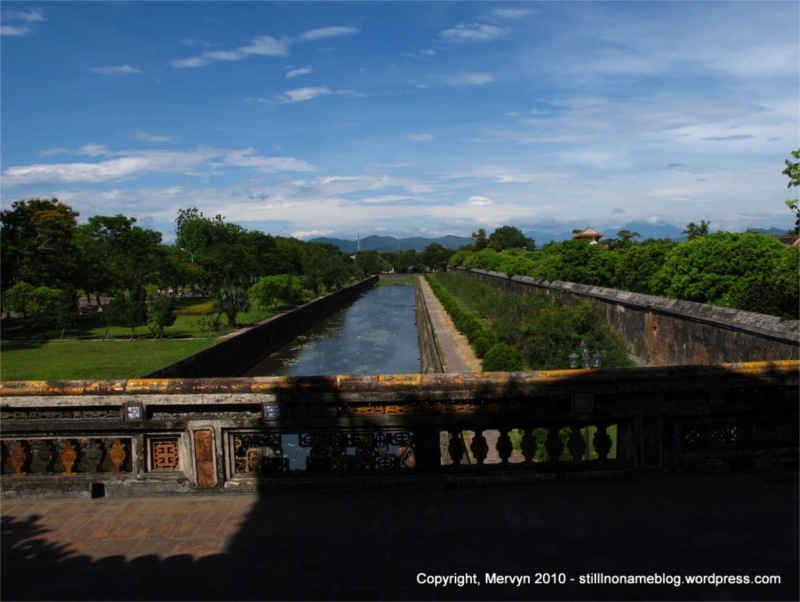 Hue is the former capital of the rulers of pre-communist Vietnam. Located on the shores of the Perfume River, the city was founded in 1802 by the first of the Nguyen emperors, Gia Long, and served as the dynastic capital until 1945. This means the buildings aren’t particularly old, but they do have some history. As a tourist, the main draw is the Citadel, which sits on the north bank of the river. Contained within the citadel is the Imperial Enclosure, home of the emperor. 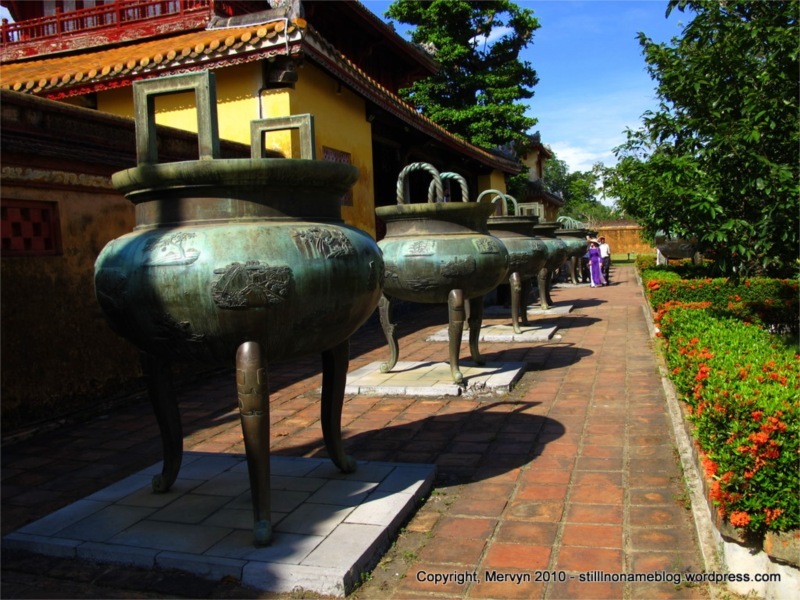 In the surrounding areas are pagodas and various imperial tombs. That sounded like a lot, especially considering I’d given myself only a day-and-a-half to do the whole area. I got up at 6 a.m., rented a motorbike for $3 and zipped off to the Imperial Enclosure to do my tour in what I hoped would be the cool of the morning. 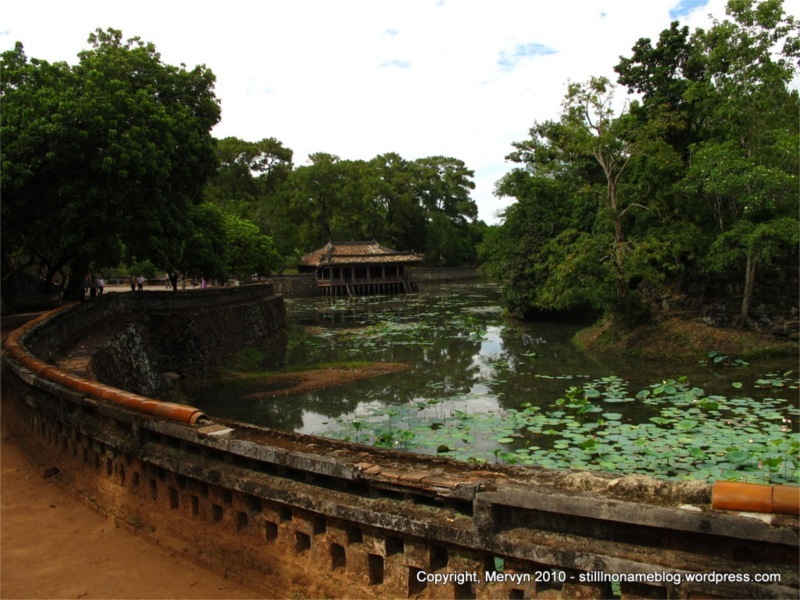 The plan was to meet up with Reuben and Michelle at 11 a.m. after they visited the Imperial Enclosure so that we could visit the Thien Mu Pagoda and at least one of the emperor tombs. It felt like nearly everything was being renovated. The whole right side of the complex was covered in scaffolding and, even though it was only 7 a.m., the place was filled with the sounds of circular saws and hammering. Despite all that, my walk around the complex was almost meditative. The sun wasn’t blazing in the sky and there were almost no tourists since it was so early. One thing broke the tranquility, though: stifling heat. That’s nothing new. It’s hot in Southeast Asia. You deal with it. What made this remarkable was what was missing. When you build a Citadel with protective walls and a moat, then build another mini-citadel inside that one with more walls and moats for your Imperial Enclosure, you pretty much kill one of the most underrated features of an attractive city: wind. All those walls and moats get in the way of any breeze. You normally think of wind chill in winter. You know, “Wow, it’s snowing out and wind chill is making it feel 20 degrees colder.” That kind of thing. Wind chill is a billion times more important in the tropics. The difference between 100% humidity and 90 degree heat with a breeze and without is the difference between lounging on a San Diego beach and munching on a bhut jolokia pepper in the Sahara while being doused in gasoline and lit on fire with a giant magnifying glass. A 2 mile per hour wind is the difference between life and death, oven and refrigerator, a soaked shirt and a merely damp one. The Imperial Enclosure has no breeze. And its absence dramatically affected my feelings for the place. Oh, it’s pretty, but when you’re trying not to soak your camera with your own sweat, it makes picture taking less fun. It makes reading signs about history less interesting. It makes standing at the edge of a moat an exercise in self-restraint as you consider hurling yourself into the cool, slime filled waters. This is a reason, and not an excuse, why I don’t know what I took pictures of that morning. The light was decent since the sun wasn’t directly overhead. The colors were good in the softer morning light. This tourist, however, learned next to nothing about the structures, history, or symbolism. He just put one foot in front of the other and tried not to let skin touch skin lest his own flesh be pasted together forever. There were houses and a tennis court that an emperor had built in the 1900’s. There was a residence for an empress. There was a Forbidden Purple City area reserved for the emperor alone and where the only servants allowed in were eunuchs so as to protect the monogamy of the royal concubines. It was all fine and dandy and a total blur of plodding and sweating. The weather so affected my judgment that my favorite spot on the whole visit was the platform above the main entrance. I was about to exit through the gate whence I’d entered when I noticed a staircase to a platform above. I hiked up and discovered the most glorious breeze coming over the wall of the Imperial Enclosure. I, along with a pack of weary, early riser Vietnamese tourists, sat on some steps beneath a giant Japanese-style drum and soaked in the earth’s natural electric fan. None of us moved for at least 15 minutes. Tourists started pouring into the Imperial Enclosure on organized tours. Most seemed to be Vietnamese or Chinese. After drying off on in the breeze, I headed back to the hotel to hide from the heat and write. At 11 a.m. 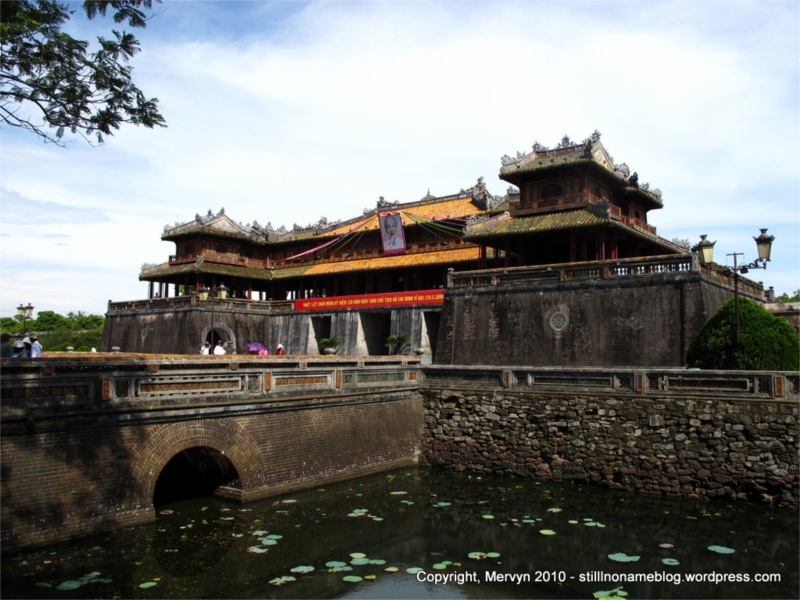 I met Michelle and Reuben at the Imperial Enclosure entrance and we caravanned our motorbikes to the Thien Mu Pagoda a couple kilometers west of the Citadel. 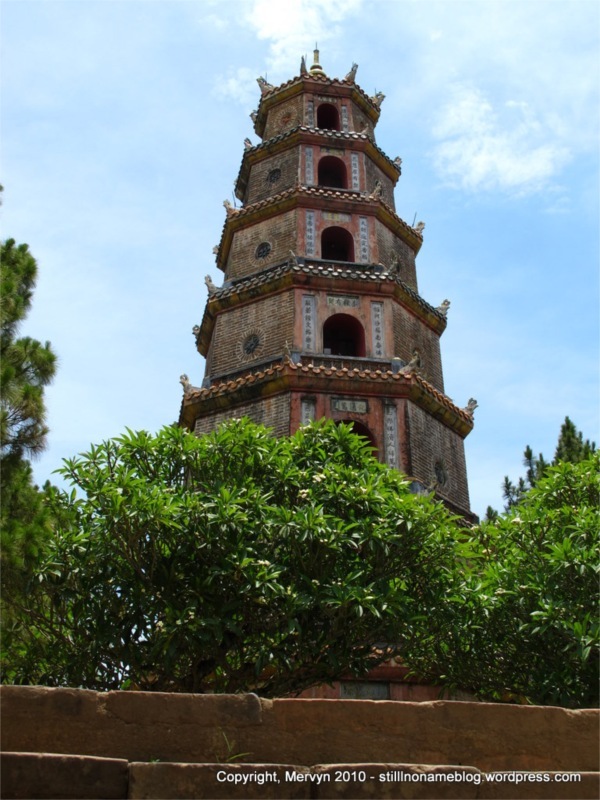 This pagoda is as iconic a symbol of Hue as the Citadel. It’s a 21 meter tall octagonal tower set on a hill overlooking the Perfume River. Founded in 1601, it’s been destroyed and rebuilt many times. 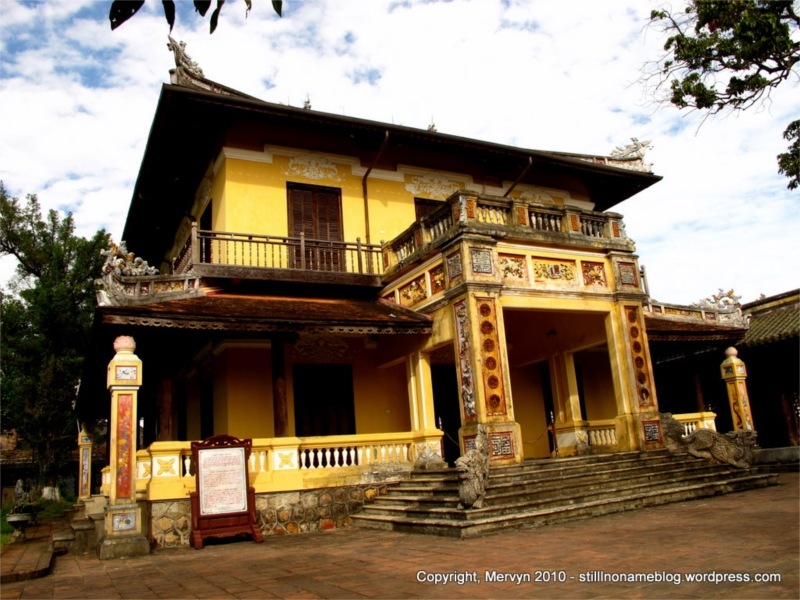 It houses a working monastery and was home to a monk who, in 1963, traveled to Siagon where he performed a self-immolation to protest the policies of South Vietnamese President Ngo Dinh Diem. This monk is better known in the U.S. as the person who’s on fire on the cover of the Rage Against the Machine debut album. They even have the car that Thich Quang Duc (the monk’s name) used to travel to Saigon. The pagoda complex does have a breeze. I immediately liked it more than the Imperial Enclosure. In the back, young monks rested in the grass under the shade of the trees. One had even climbed a tree to find a branch on which to nap. I half expected them to be attacked by ninjas and to watch an awesome kung fu fight scene. Maybe it’s just me. . .
We headed out to another pagoda which, for the life of me, I cannot name. I get this way when I have more than one activity in my day. My brain is small, like a rotten walnut. We stopped for lunch at a local place. So local, in fact, that no one spoke any English and we had to order food by pointing and praying. We did not pray hard enough. 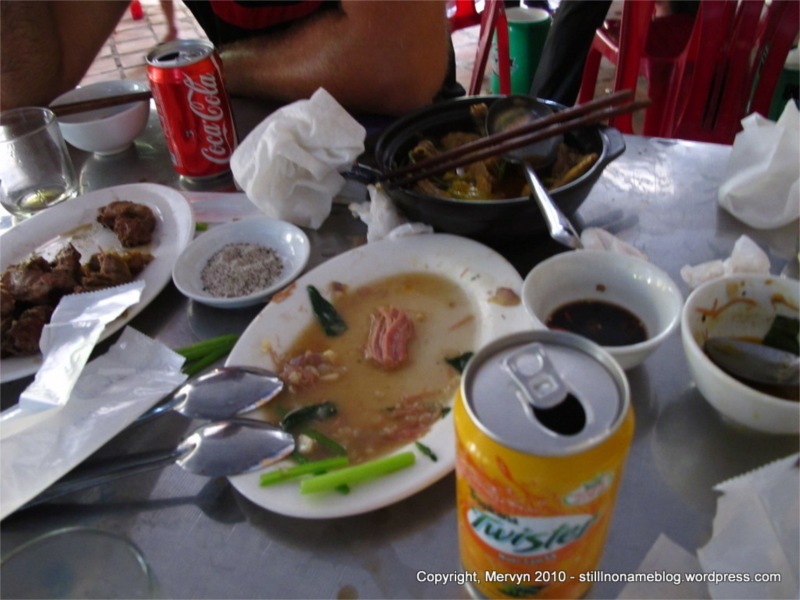 We ordered two duck dishes after matching words from the menu to my Vietnamese phrasebook. They contained, as Reuben put it, “the saddest parts of the duck.” It was mostly bones with bits of tough, stuck on meat. We had to fight for anything tasty. We ended up eating all of the one vegetable dish we ordered and half eating the rest. And it was not cheap. And the power cut out halfway through our meal so we lost the electric fan. It was a failure of a meal. 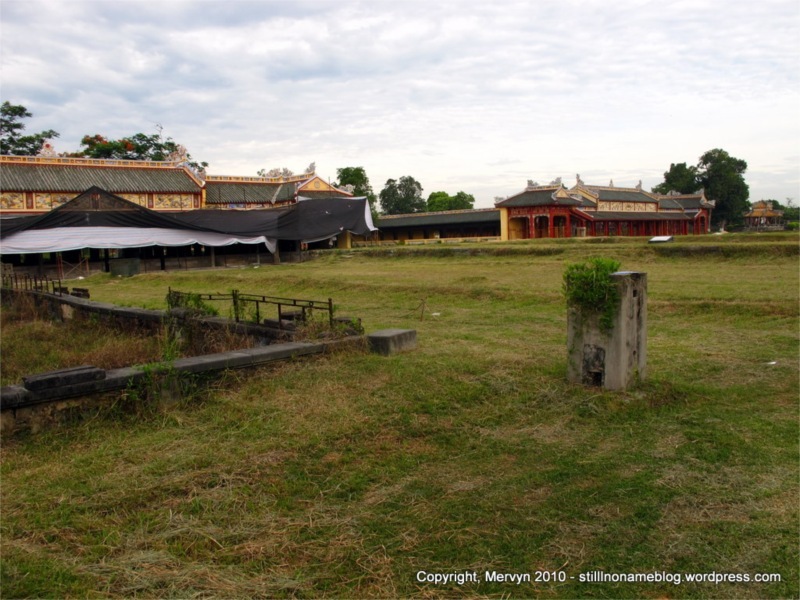 After confusing the locals, we set off for the tomb of Emperor Tu Duc. This was actually quite peaceful. 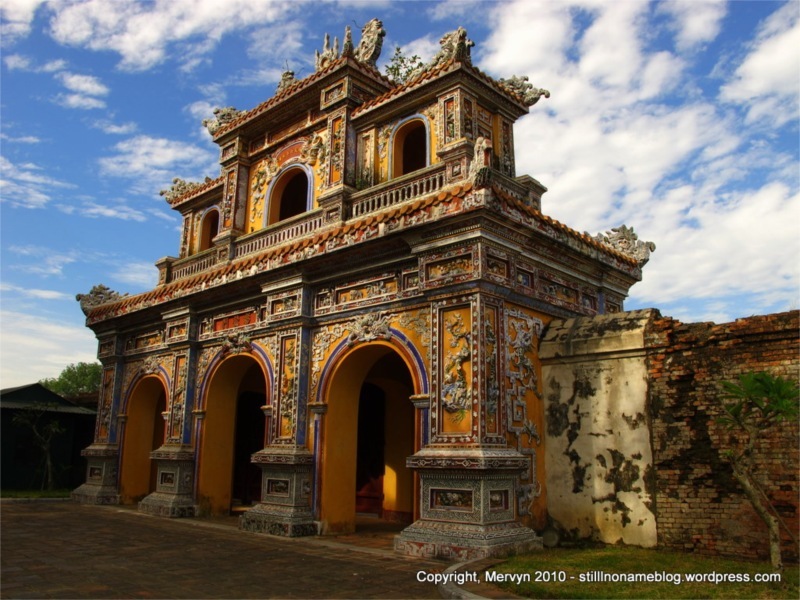 Each Nguyen emperor constructed his own tomb during his lifetime. 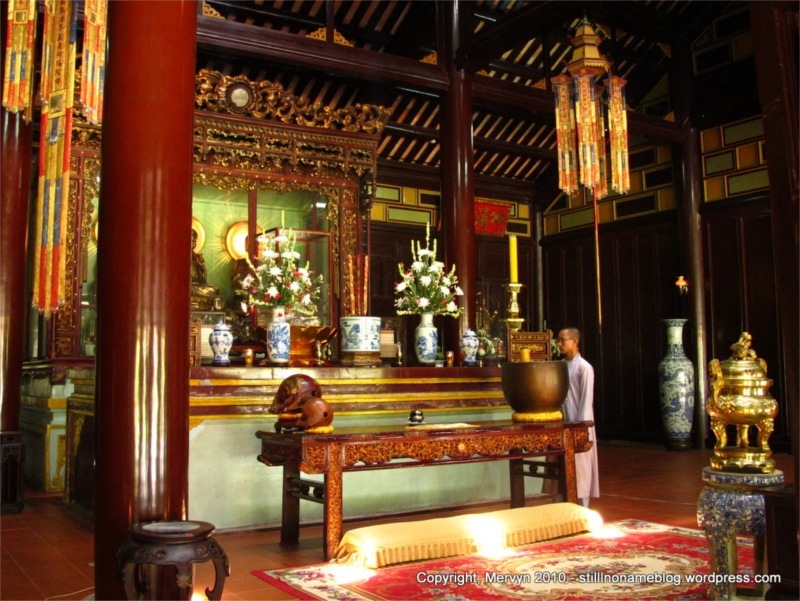 Tu Duc also used his as a retreat while he was still alive. Set off in a forest, highlights included the Minh Khiem Chamber which was used as a theater, the tomb for the empress, and a tomb for his adopted son. 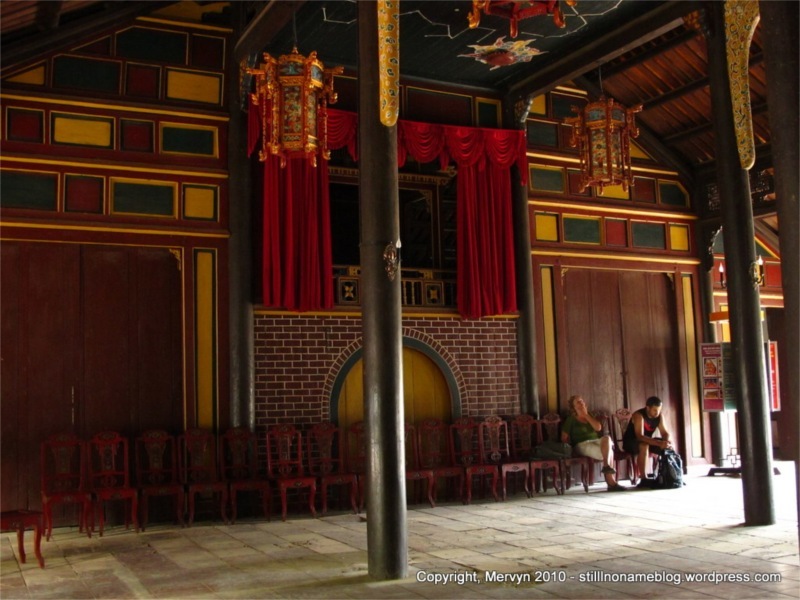 My favorite by far was Sung Khiem Pavillion where the emperor would hang out with his concubines and compose or recite poetry. It overlooks a lily-filled pond. The emperor apparently had concubines designated specifically for trips to his tomb. I like to think of them as his emo hos. Finished with the tomb, we headed back to Hue. I took a quick shower in the hotel’s public bathroom, then Michelle, Reuben, and I all ended up on the same night bus to Hanoi. My day-and-a-half in Hue finished off with a spectacular sunset over rice paddies taken in from a half-reclined position on the Hanoi night bus. A quite busy day. I felt a bit tired and hot. Indulging myself in a way the former emperors could not, I turned the vent from the bus’s air conditioner to my face and blasted myself with some freezing artificial breeze. Better to be an unemployed American today than a dynastic ruler 100 years ago. GALLERY: Click through to today’s gallery for bonus pictures including sleeping monks in trees, a sunset over rice paddies, and Mervyn playing emperor sans poetry readings and concubines. ← Day 80 – How’s Your Capitalism Treating You?